By the mid-sixties car manufacturers had recognized America’s fascination with muscle and were actively building cars that were bigger, stronger and faster than their predecessors. However, there are a few models from the early sixties that can be pointed out as clear evolutionary steps in the history of the American muscle car. The Pontiac Ventura 389 is one of those cars. Fueled by a Tri-Power V-8 the Ventura had a sky high for the time 345 horsepower with a “Super-Duty” package capable of kicking it up to 363 bhp during chassis dyno testing. The big motor pushed the Ventura from a stand-still to 60 mph in just 8.2 seconds and a quarter mile time of 15.5 seconds. 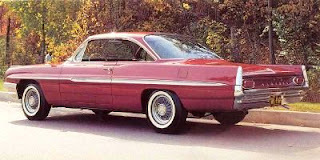 The 1961 Ventura was a full 200 lbs lighter than earlier models. It had a classic bubble top design and jewel-tone monnokide upholstery. Off the assembly line the Ventura cost $3200. Fully restored a Ventura can go for as much as $60,000-$70,000.